This data represents the Global smartphone market share by quarter (from 2016-2018) by top OEMs. Global smartphone shipments by market share and millions of units is provided. 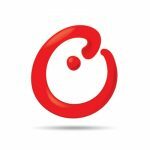 For detailed insights on the data, please reach out to us at contact(at)counterpointresearch.com. If you are a member of the press, please contact us at press(at)counterpointresearch.com for any media enquiries. *Ranking is according to latest quarter. The top 10 players now capture 79% of the market leaving 600+ brands to compete for the remaining 21% of the market. iPhone helped Apple to record 3rd quarter revenue even as shipments remain flat YoY. Samsung continued to lead the smartphone market with 19% market share in the quarter. Smartphone shipments declined 2% annually to 360 million units in Q2 2018. 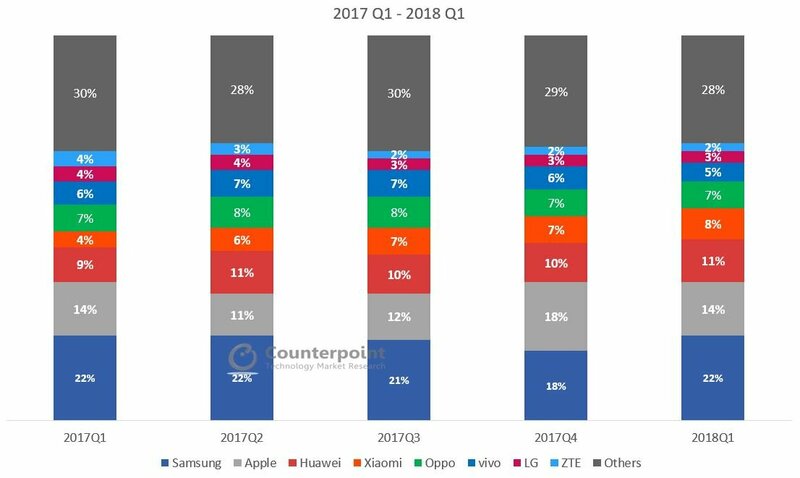 The top 10 brands accounted for 79% of the smartphone volumes in Q2 2018. 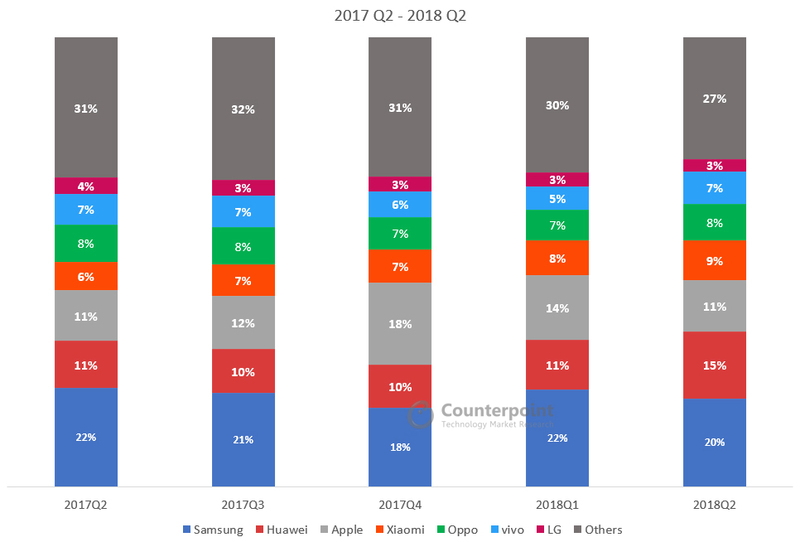 Samsung led the smartphone market by volume with a market share of 20% in Q2 2018 even though it registered an annual decline of 11% due to weak sales of its flagship Galaxy S9 series smartphones. 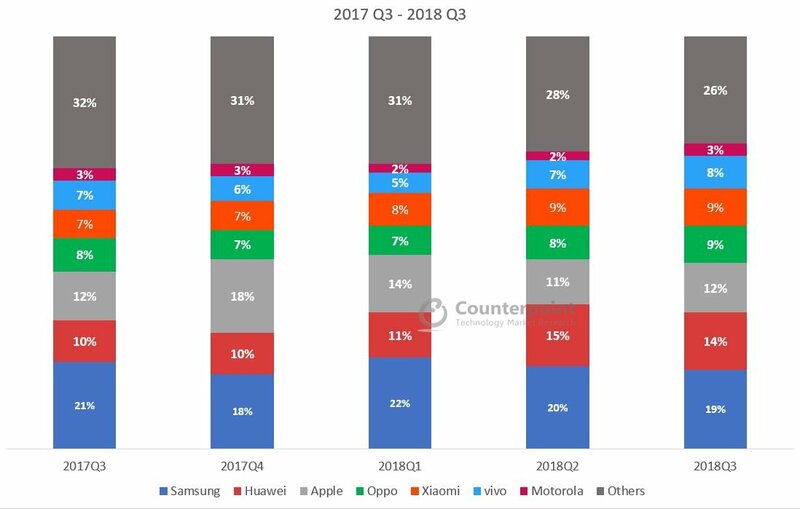 Huawei shipments grew 41% annually in Q2 2018. The company managed to be the fastest growing (21%) smartphone brand amid a declining China smartphone market and grew fully 71% overseas. Apple shipped 41.3 million iPhones during Q2 2018, up 1% compared to the same quarter last year. iPhone X remains the top seller for Apple during the quarter. Smartphone shipments declined 3% annually reaching 360 million units in Q1 2018. Smartphone penetration fell to 76% of all the mobile phones shipped in the quarter. This was partly due to an increase in feature phone shipments by some key brands such as Nokia HMD and Reliance Jio who both saw YoY growth. 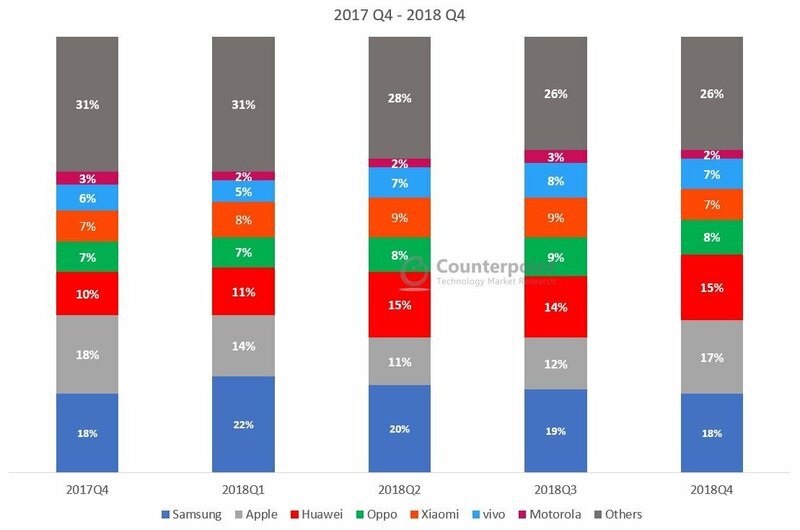 Top 10 brands accounted for 76% of the smartphone volumes in Q1 2018. 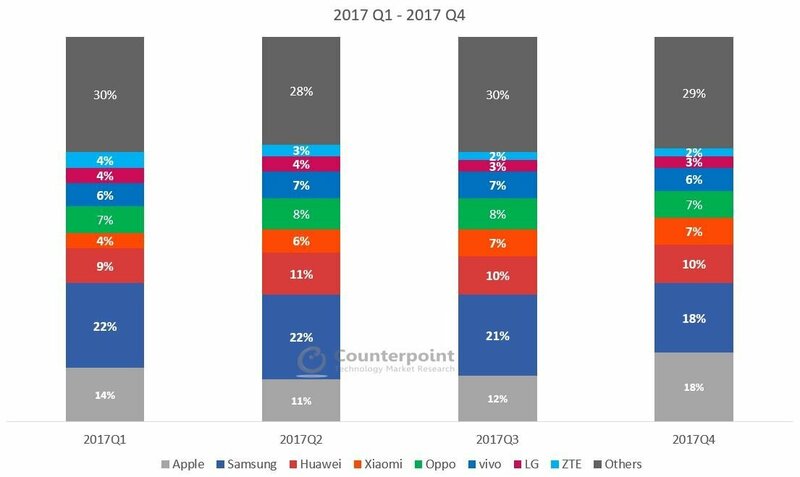 Samsung led the smartphone market by volume with a market share of 20% in CY 2017. However, it lost the top spot to Apple in the fourth quarter of 2017. OPPO and Vivo were the fourth and fifth largest brands during the year, capturing market share of 8% and 6%, respectively. The aggressive expansion of these brands in markets outside mainland China will be the key to growth as the home market reaches saturation levels in 2018. Although smartphone market in mature markets is saturated but some of the emerging markets such as India, South Africa, Indonesia, Nigeria, Kenya are hot destinations for OEM’s which are moving beyond domestic boundaries in quest for expansion.